Welsh rugby legend Gareth Thomas believes that coming out as being gay was the greatest thing he has ever done. He says he is constantly being told how the example he set by doing it has helped other men struggling to be open about their own sexuality. Gareth, who captained Wales in 2005 to their first Grand Slam victory since 1978, also skippered the British Lions tour of New Zealand and then switched codes to play for the Wrexham-based Crusaders Rugby League side. He retired game last year and his remarkable story is now being made into a Hollywood feature film with Oscar nominee Mickey Rourke as star. 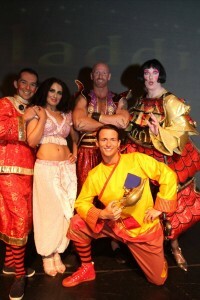 Before then, he is making wishes come true, starring as the genie in a pantomime production of Aladdin. at the Stiwt Theatre, in Rhos. Gareth will be swapping Aladdin’s lamp for a globe when he and fellow members of the cast come to the Eagles Meadow shopping centre, in Wrexham, at 10am next Monday (December 10). 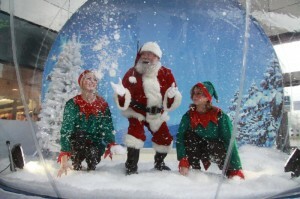 They will be there to officially open a giant Snow Globe which will give shoppers the chance to have their photograph taken against a picturesque winter backdrop. Gareth and the gang will also be putting the globe to the test by staging a last-minute dress rehearsal before the production starts for real at the Stiwt the day after. The clear PVC globe, which is making its first appearance in North Wales, stands over 13ft tall and measures around 10ft across. Realistic-looking snow, of the same type used on Hollywood movies, is pumped around it by a large fan and flutters down just like the real thing to coat scenes such as a winter-time forest and a Cinderella tableau. 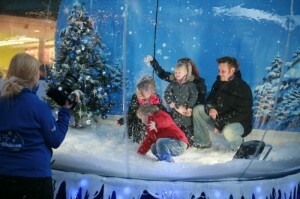 People enter through a special chamber at the rear and once inside can pose for seasonal pictures – and play around in the snow. Ian Hutchinson, from Hertfordshire-based Photographic Synergy which has been operating the globe in the UK since 2008, said: “Basically, it’s like one of the traditional hand-held globes which you shake up and snow falls inside – only this is much bigger and a lot more fun. 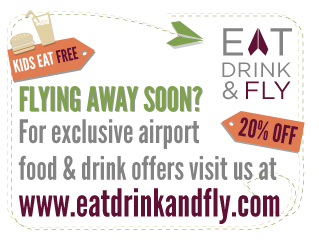 We’ve had it in various locations across the UK, such as Hyde Park in London, over the past four years and it always goes down a storm – or a snowstorm, you might say – because people have never seen anything like it before”. Taking a break from learning his lines, Gareth – known affectionately in his playing days as “Alfie” – recalled how he dropped a bombshell when he “came out” as gay in 2009 after years of living as a straight man married to his teenage sweetheart. At 6ft 3ins, 16st and 100 caps to his name – more than any other player in Welsh history – he also had one of the fiercest reputations on the field. But he says he hasn’t looked back announcing his gayness and is constantly asked to give advice to other men on how to be as honest about their sexuality as he has been. Love your site! I’ve been watching the Seven Dwarves doco here in Australia, and have found a deeepr understanding and appreciation what little people deal with day in and day out. Jamie was one of my favourite episodes! I’ll keep checking back, Little Lady! Take care! Stuart Forster on Slovenia – Could this be the perfect DINKY destination? Content published on this website may contain information, points of view, opinion, images, etc. made or distributed by the author and no responsibility, expressly or implied, will be accepted by the staff, editors or owners of this website. This website is a free public information service published in good faith and should be treated as such. Copyright 2005 > 2016 Codex international.